BISE – Bannu Board of Intermediate & Secondary Education,(Screening Test) (List of Candidates) and Roll no Slip Online Test Date: Sunday, 17th December 2017. 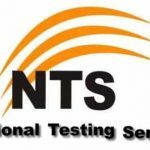 If you do not receive your BISE – Bannu Nts (Screening Test) Roll No. Slip till 16th December 2017. Get a printout of your information displaying on this page and contact NTS Help Desk along with Original CNIC at your Reporting time. You will be issued provisional Roll No. Slip at the test center. Students can also get the print of the roll number slips. Students can select the print option and press the (ctrl+p) and get the print of the Bannu Board of Intermediate & Secondary Education roll number slip. It is for your information that NTS Call Center is now globally activated. You can contact at the number given below for all your queries and concerns. This number is operational. You can now contact us through this number and all other numbers for info/query are inactivated with immediateeffect all over the Pakistan.